We are proud of our success at the HIA Victorian Housing and Kitchen and Bathroom Awards. In 2008, we won the HIA Central Victoria/Mildura Regional Housing Award for a Display Home up to $250,000. 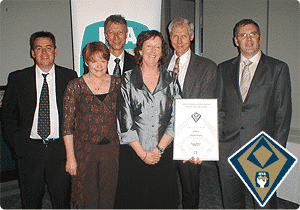 In 2009, we were runner-up in the HIA Energy Efficient Housing Award for the whole of Victoria. In 2013, we were a finalist in the HIA Western Victoria Regional Housing Awards for our display home in Ballarat. All our queries were attended to promptly, and usually on the same day or the following day. Indeed it seemed like none of our queries were too much trouble, and the feeling of personal attention we received was greatly appreciated. It was great dealing with a family business where everyone knows what’s going on. Indeed, you made us feel like part of your family! Before signing the contracts to build our new home, we met with the Cliffords (owners of the company). It was very reassuring knowing that we could contact them easily if we were to have any troubles along the way. We both left the meeting feeling very confident that we had chosen the right builder. Whilst it was our third time round building a new home, it was definitely the less stressful project. We are very happy with our beautiful home that was built for us and would be more than happy to offer a personal recommendation at any time. Not only do they build a home of top quality, they genuinely care for their customers and do their best in ensuring it is a positive experience for all involved. Just wanted to say a huge thank you for my beautiful new home. It truly has been a wonderful experience building with you. From day 1 when we first met Jenny our sales consultant in Ballarat we knew we wanted to build with you. You really have a wonderful caring team that were there for us every step of the way. Special mention to our colour consultant Wendy, your guidance was invaluable. We have had many family and friends though our new home and everyone comments on how beautiful the finishes are. How perfect our colour scheme works together and how the house actually feels like a home. I have had pleasure in recommending our Builder to others and I know of one who has decided to go ahead and build with you. I remember our first meeting with Jan. Her parting words were “Welcome To The Family” and that’s exactly how we felt part of a family. We couldn’t of had a better team guiding us through this new stage in our lives. Once again thank you all. A big thank you to your whole team, Pleasure doing business with you all. From the display home service, to head office to the building team and supervisor. The whole experience was first class, you treated us like family. Thank you for being such professional people to deal with. We really enjoy dealing with you. Your kindness is always appreciated.